Supported by a team of experienced professionals, we are engaged in offering a wide array of 50Ltr AFFF Mechanical Foam Fire Extinguisher to our respected customers. 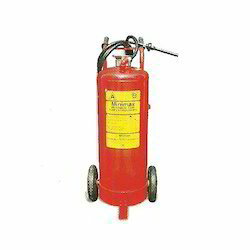 Mechanical Foam Type Fire Extinguisher are ideal for use on Class A and B Fire Risks. 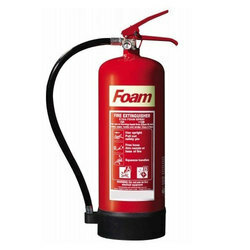 The Foam fire extinguishers are available in 6ltr and 9ltr standard models. Due to our immense capability in this work domain, we have brought forth a huge variety of Foam Fire Extinguisher. We are dealing only in ISI marked and TAC, MAC, UL and CE approved product. Riding on vast volumes of expertise in this arena, we are occupied in offering Mechanical Foam Based Fire Extinguisher Stored Pressure. In conformity with the standards as set by the market, these are verified before getting dispatched. More to this, their obtainability with us at market leading rates makes these highly applauded.